1. The yolk’s color is dependent on the hen’s diet, and farmers’-market eggs from well-fed pastured hens tend to be richer and deeper. 2. Both the yolk and the white should stand tall. 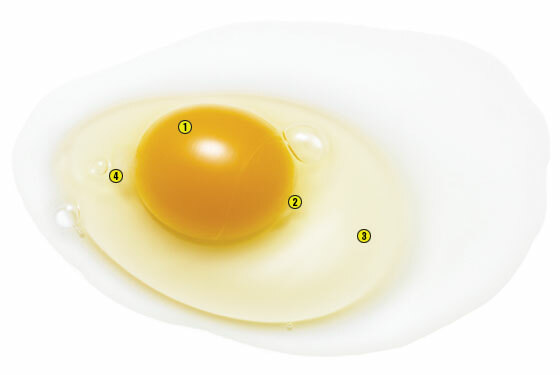 Inferior, older eggs look flatter. 3. In fresh, high-quality eggs, the white spreads less. 4. The two strands of egg white that anchor the yolk are called chalazae, and the more prominent they are, the fresher the egg.